Paths are irresistible as they lure us along the trail to a destination, often partially obscured. Consider Dorothy on her yellow brick road or Alice when she fell down the rabbit hole! Pathways offer us an opportunity to influence the experience of the journey by the choice of materials and the manner in which they lead you from point A to point B. Straight paths suggest a sense of urgency whereas a meandering route is more leisurely and encourages exploration of little garden ‘moments’ along the way. (We’ll take a look at ideas for such features in another article). 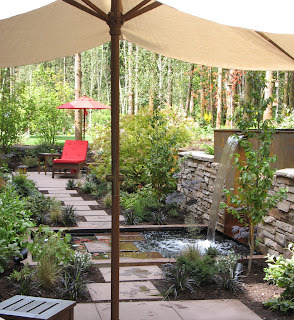 All the elements for designing paths are too extensive to cover in detail here, so I am going to focus on a few of the styles and materials which I have either used or have caught my eye. Hazelnut shells are perfect for a woodland trail and make a satisfying crunch underfoot. You can’t rush over them so they allow you time to savor special shade loving plants along the way and linger in the dappled shade. Mulch or bark is not my favorite, giving me splinters in flip-flops and kicking up dust in dry weather. However where budget is an issue this can at least be a temporary option and lends a rustic air to informal trails through large borders or forests. a water feature to a small seating area beyond. Stepping stones are easy to install and can be lifted to provide access to underground utilities if necessary. The spacing of these is important – after all you aren’t suggesting a game of Hopscotch! Using one oversize stone or two medium ones side by side at the start of such a path gives a sense of importance. Who can resist stopping to read these bricks? Bricks have been used for pathways for decades and can be laid in a variety of designs including herringbone and basket weave. I love the way the homeowners have made the most of the etched writing on these bricks. I spent ages reading them! Stone comes in an array of colors, shapes, sizes and thicknesses but one thing they all have in common is their higher cost. Having said that an elegant home deserves an elegant path to the front door so that may be the place to splurge on a Pennsylvania bluestone for example, compromising with gravel in a less important area. Concrete tends to be the builders material of choice. It can be given a brush finish, have aggregates added, be stamped, colored, etched or cut into pavers and cobblestones. I recently saw a fascinating path outside a contemporary home, where rectangular slabs of concrete had been set into the ground at 45' angles It felt a little like walking along the bar in gym class! The theme was continued with panels of stainless steel diamond plate, a material usually found in workshops and tool boxes. This sculptural treatment set the scene for a fascinating architectural journey through a wild landscape. 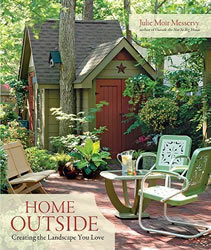 If you would like more ideas on how to design gardens including pathways to suit various functions I highly recommend Home Outside by Julie Moir Messervy (author of The Not So Big House). Invaluable to designers and keen homeowners alike, this book takes the mystery out of landscape design principles with great illustrations, photographs and an easy to read text. I have re-read it many times and always learn something new. Heirloom Veggies - what's all the fuss about? Garden Design - planning special 'moments'.